These gorgeous cowls use only 1 skein of yarn each, making them economical to make. The beautiful colors of the yarn in each cowl make them perfect to wear with any outfit! Each cowl has a quick-to-memorize 1, 2 or 4 row repeat. 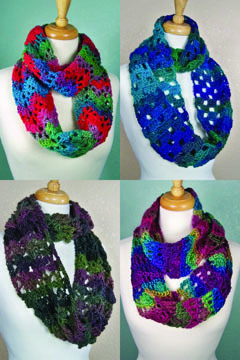 Made with easy care acrylic yarn, these may become your favorite cowls for years to come! The pattern is easy to follow and includes full instructions for making each of the cowls. It also includes a symbol crochet chart for each cowl, if you prefer working from a chart! Each cowl pattern (Ripple, Checkerboard, Trefoil and Waves) is available separately, or purchase all 4 cowl patterns in this specially priced set. Note: Photographed model made with Red Heart Boutique Unforgettable in #3945 Parrot. Note: Photographed model made with Red Heart Boutique Unforgettable in #3935 Dragonfly. Note: Photographed model made with Red Heart Boutique Unforgettable in #3940 Echo.